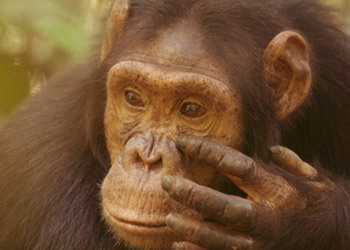 7 Days Uganda safari with chimpanzee tracking, wildlife, Gorilla Trek & Lake Mburo. Explore the best attractions in Uganda on this 7 days Uganda safari starting with visit to Kibale forest for chimpanzee tracking, transfer to Queen Elizabeth national park a savanna park with wildlife viewing on game drive and a launch cruise along the Kazinga channel mountain gorilla trekking in Bwindi impenetrable forest and lastly visit lake Mburo national park renown for Zebras. After breakfast at your hotel in Kampala, your guide shall pick you up and transfer to kibale forest national park. On the way you’ll branch in Mubende town to visit Nakayima tree shrine, a heritage site that dates back to 1100 AD. You’ll proceed to the park check in at your lodge; it’s time for diner, spend the night at primate lodge/chimpanzee guest house/kyaninga lodge. After breakfast early morning, get to the center for briefing and after embark on the forest walk searching for chimps. When they’re found, enjoy 1 hour with them. As you return for lunch, the guide shall identify primates like red colobus, black and white and black colobus and many more. After lunch, take a short drive to Bigodi wetland. You’ll do a 2 and half hours swamp walk or if you’re a bird watcher, you’re given 4 hours. Through the swamp, you spot primates like grey cheeked Mangabay, L’hoest monkey and a variety of birds, butterflies, snakes. Enjoy a cold drink with locals and drive back to your lodge for dinner and overnight. After breakfast leave kibale and transfer to Mweya tourist center in Queen Elizabeth national. After lunch take a boat cruise on kazinga channel for a chance to see hippos, crocodiles, water birds and mammals that come to drink such as elephants, buffaloes, waterbucks. The rest of the evening is for relaxation, dinner and overnight at Mweya safari lodge/Katara lodge. After a cup of coffee and start you’re a game drive at 06:30am early in the morning. 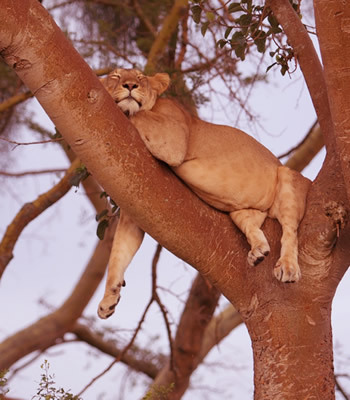 Expect to encounter early risers like lions, hyenas, elephants, buffaloes, leopard and several antelopes such as Uganda kob, topi, eland and many more. Return for late breakfast and transfer to Bwindi passing through Ishahsha wilderness where you hope to see tree climbing lions. You’ll continue to your lodge in Buhoma for dinner and overnight either at Buhoma lodge/gorilla mist camp/Silverback lodge. Wake up early for breakfast and take head to the gorilla center for briefing about gorilla rules. Although, you might have a strenuous trek through the forest, the guides give you a guaranteed a full hour with gorillas after they are located. Return for lunch and in the afternoon you may take a village walk to the ride for a woman co-operative center in Nkwenda trading center. You learn the cultural and rural life with traditional dance entertainment and lots of crafts to buy. Back for dinner and overnight at the lodge. Early morning after breakfast, you’ll drive to Lake Mburo national park passing via Igongo cultural museum for en route lunch and exploring the museum. Proceed to your lodge arriving in the evening for dinner overnight at Rwakobo rock lodge/Mburo safari lodge. After breakfast, you’ll walk on foot with a ranger to the salt rocks where antelopes like impala (only found in this park), topi, and buffaloes are seen licking salt with buffaloes and warthogs. Return for lunch and after drive back Kampala reaching in the afternoon. Transfer to the airport for departure.